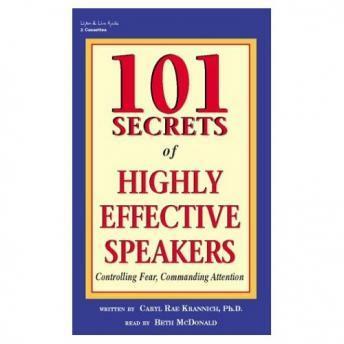 Listen to "101 Secrets of Highly Effective Speakers: Controlling Fear, Commanding Attention" on your iOS and Android device. It was ironic that the book was written to improve a person's speaking abilities and this audio book’s ability to hold my interest was so terribly lacking. The information was great, but it was very difficult to take it all in from the delivery used. The paper book would be more effective. Or they should take their own advice and redevelop the audio delivery. It was difficult to force myself to listen to the entire program. The speaker was great. For the rest well, it read like a list. I am not sure what I was expecting but this was not it. Don’t get me wrong I found good information in it. I was looking for a more in-depth discussion on each item. Maybe it was the abridged version but it felt like there was content lacking. It would have ranked higher, but the program seemed rather long for the amount of information presented. There are definitely some good "take-home" messages that can benefit just about anyone, and the range of topic areas is quite broad.